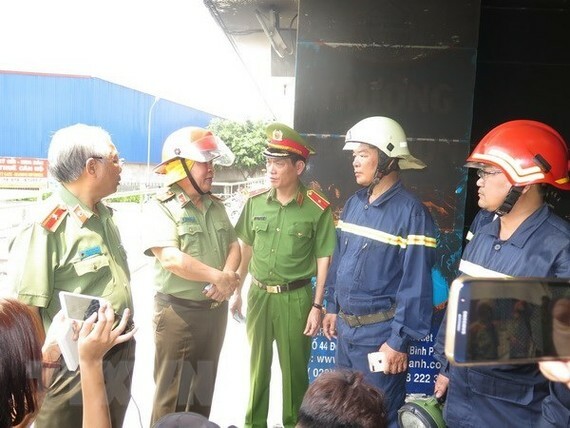 Spokesperson of Ho Chi Minh City police Nguyen Si Quang on March 26 said criminal proceedings started against a case of serious blaze which burned the local apartment complex Carina Plaza on March 23. The proceedings are in line with the 2015 Criminal Code’s Article 313 on violation of fire safety regulations. Quang said investigation at the scene identified a malfunctioned scooter as the cause of the incident, with an arson attempt excluded. Detailed information will be announced at a press conference of the municipal People’s Committee scheduled for March 29, he added. Located at No. 1648 Vo Van Kiet street District 8, Carina Plaza is a high-end apartment complex including three buildings with 15-21 storeys and 736 apartments. It was put into use six years ago. As many as 13 people died and tens of others were injured when the blaze started at 0:30 from the parking basement between Buildings A and B of Carina Plaza. Hundreds of people were stuck and rushed to upper storeys. The Fire Fighting Police Department of the city sent 34 fire trucks and 200 police to the site to control the blaze and rescue stuck people. One hour later, the fire was under control, but smoke still covered the buildings. Hundreds of people escaped safely. By 16:00 the same day, 35 injured people were discharged from hospitals and 56 others were still undergoing treatment. Multiple supports have come to victims of the fire. Most recently, on March 26, a delegation from the Central Committee of the Vietnam Fatherland Front (VFF), led by its Vice President of Truong Thi Ngoc Anh, visited injured residents at Cho Ray Hospital. The delegation also visited the family of Tran Van An, a guard of the burned building, who died from the fire. 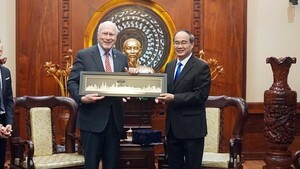 The committee has decided to support nearly 200 million VND (8,820 USD) for the victims.